Mega Salamence? Check! Mega Altaria? Check! Mega...Lopunny!? Who saw that coming? 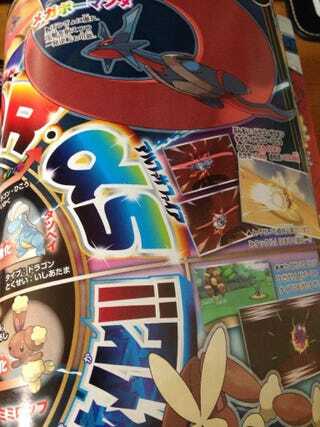 So CoroCoro has been leaked, and with it a bunch of new info on ORAS. This months edition shows off three new Megas, contests and an event! First up is Mega-Salamence, who becomes the Batwing and gains the ability Aerilate. Mega-Altaria becomes a Dragon/Fairy Type(called it). It gains the ability Pixilate. Mega-Lopunny becomes Normal/Fighting-Type and gains the ability Scrappy. It can also learn Hi Jump Kick now. As for the contests, not much is know except you get a new costume from a well known idol called Lucia. When Pikachu cosplays it learns new moves! Pikachu Rock Star gets the move Meteor Mash, Pikachu Ph. D. knows Electric Terrain, Pikachu Pop Star knows Draining Kiss, Pikachu Belle knows Icicle Crash and Pikachu Libre knows Flying Press. It seems as though Mega-Metagross won't be available in game, as an event was also announced where we get its Mega Stone along with a shiny Beldum! That's all for now! Check Serebii for anything I might have left out.